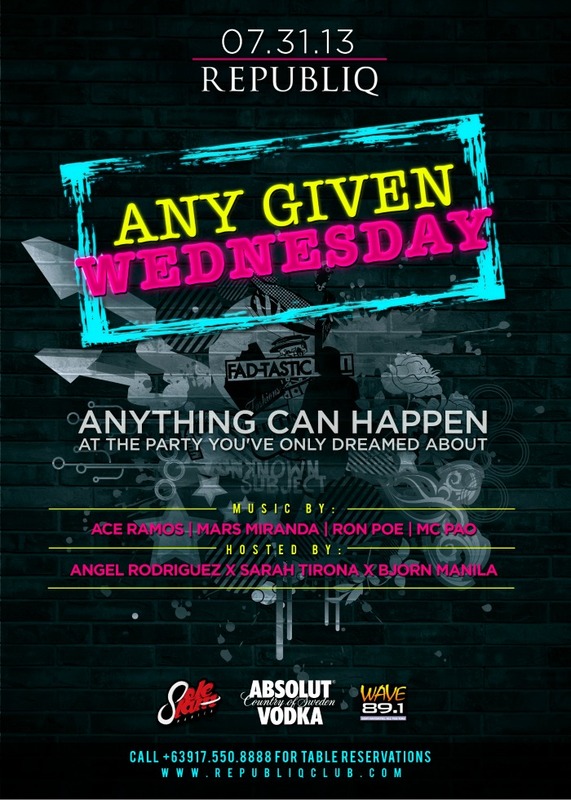 In case you guys don't have anything planned yet for tonight, or even if you do, here's a good reason to nix that and go to Republiq's Any Given Wednesday Party instead! It's the party you've always dreamed about where anything can happen. There will be colorful P100 shots, glowsticks, a grafitti wall that you can spray paint on, neon face paint, glowsticks, led batons, etc. The works. In other words, a night of fun-filled debauchery. music will be played by DJ's Ace Ramos, Mars Miranda and Ron Poe. to book an exclusive table, call 09175508888 and tell them you were referred by Sarah Tirona.